Some people are born to bake. They know how to follow instructions, drugs can measure quantities with surprising accuracy and are patient enough to do things like let dough rise or bring ingredients to room temperature. Others are a bit more implusive, health system too impatient to wait for their ingredients (but I want cookies now! ), too rebellious to follow a recipe’s instructions, tweaking and changing things as they see fit. These people may turn out some good cookies and cakes, but they’ll never be bakers at heart. I think I fall into the latter category, and so my attempts and cookies and muffins are never as successful as attempts at soups, mains and sides. Whenever I’m baking, I feel like I’m throwing everything into a bowl and crossing my fingers. I can’t taste and adjust, add a little more of some ingredient, try different accompaniments. I’m coming to terms with it. I’ll never be a baker at heart. I had some ground rules for this soup recipe. Since it’s just me and my mom cooking for a large crowd, it had to be somewhat simple. No simmering for hours, straining, simmering or making a roux. There will be enough of that with all of the other Thanksgiving dishes. This soup is super simple — a quick saute of shallots, carrots and garlic, then add some canned (or pureed) pumpkin and stock and simmer for awhile. Run it through with an immersion blender, then stir in some cream, smoked paprika and sherry vinegar. 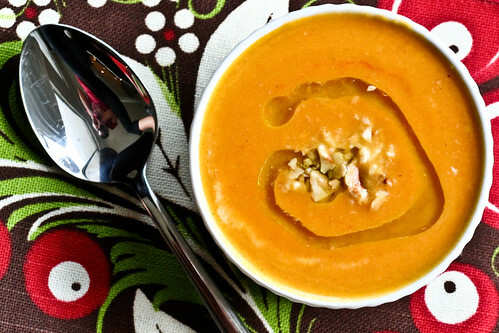 Top it all off with a good drizzle of olive oil and some crushed hazelnut and you’ve got a bright orange, smoky sweet soup that’s perfect for a Thanksgiving first course. Note: You can certainly make this soup a day or two before to save time. Just leave out the olive oil and hazelnuts until you’re about to serve. This soup would also freeze well (again, without the oil or hazelnuts). Set a pot over medium heat. Once it’s hot, add the butter and shallots. Saute for 2 – 3 minutes, until the shallots just begin to get translucent. Add the carrots and garlic and sautee for another 5 minutes. Add the pumpkin and stock. Once the liquid comes to a slow boil, cover and reduce the heat to medium-low. Simmer for 25 – 30 minutes. Using an immersion blender (or regular blender or food processor), puree the soup for a couple of minutes, making sure all large chunks of carrot have broken up. Return to heat and stir in the cream and paprika. Taste and add salt if needed. Stir in the sherry vinegar. Ladle into bowls and drizzle with olive oil, then sprinkle with the hazelnuts. OK – you made me go back and look at the towel again. It is striking – easy to see why you’d choose it for a fall backdrop. And while I am looking more closely – is that you reflected in the spoon? Very meta, Mel. I have a small kabocha squash sitting on the counter. I’d put off making anything with it because it is so beautiful just sitting around. However – it is also called a “Japanese Pumpkin”. Think I will roast it up and try a half-recipe of this for dinner tonight. I don’t have hazelnuts but do have some great local organic pecans I think will work. Deb – Yeah, that’s me in the spoon. I can’t seem to get a good overhead photo without my reflection in there! Japanese pumpkin and pecans sound great! I have been waiting for this since you mentioned it on Twitter! Yum! Soup is a perfect first course. Thank you! This sounds like a quick and easy starter – I like it. I like the sound of this one, and thanks for posting it. shallots, smoked paprika and sherry vinegar sound like nice additions to the core flavor. I just finished making this recipe. I forgot the “cream” but used “sour cream” instead and it was still super yummy. Drizzling the Olive Oil that I got while in Italy was an added bonus! I think later this week I’m going to try a Pumpkin Soup version using Curry and Ginger. If you have any tips, let me know. I’m going to bookmark this blogg on Digg to get more clicks for you.